This overall view shows the general layout of the station by 1963. Things to note include the footbridge which gave direct access to the Manchester bound platform from Station Road (where the photographer stands). Also, it seems that by this date, the tracks leading round the goods shed have been cut back and serve as nothing more than short sidings. In truth, activity in the goods yard had probably all but ceased. 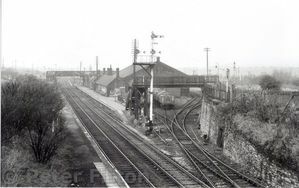 Click here for a the Blackrod Station Timeline. As a boy I spent many hours at Blackrod, living as I did up the hill, in "the "village". Like so many before and since, I was fascinated by railways in general, but I had no idea of what had once been there.